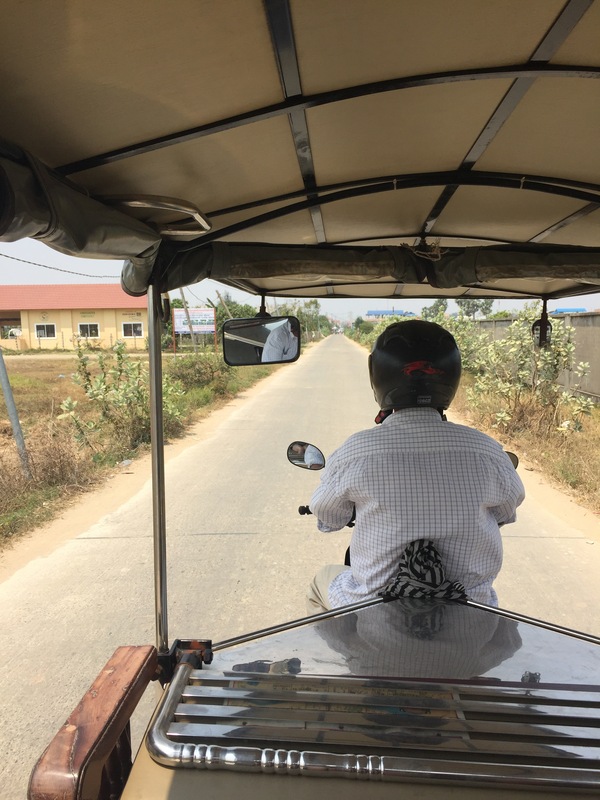 The tuk-tuk driver that dropped us at our hostel offered to take us for a day trip to the Killing Fields and S-21 (Genocide Museum) for $18. We ended up accepting this offer, as a day trip by minibus would have cost us that each! 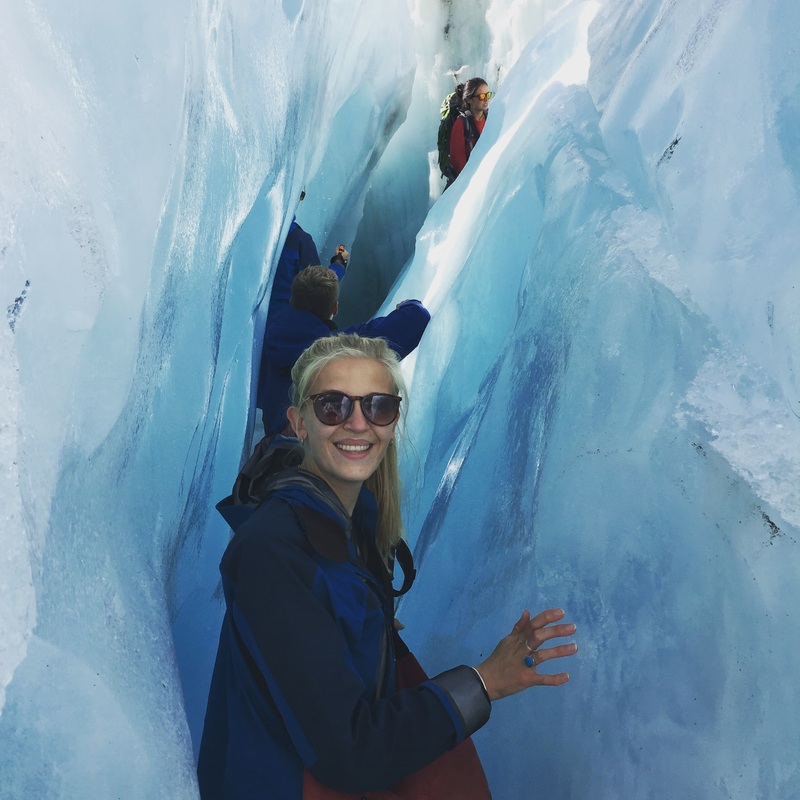 Most people we saw were doing the same trips by tuk-tuks so I think this is probably the best way to visit local attractions outside of the city (especially if there is more than one of you). When bartering for a price, remember how poor this community is and consider whether a couple of dollars really means that much to you. Our driver later thanked us for our custom, telling us that we were paying for his family’s food and some of his children’s education fees. We were first taken to the killing fields (I would actually recommend you do S-21 first as the whole thing makes a lot more sense), which is around 30 minutes out of the city by tuk-tuk (although our driver was a nutter so it may take others a little longer). 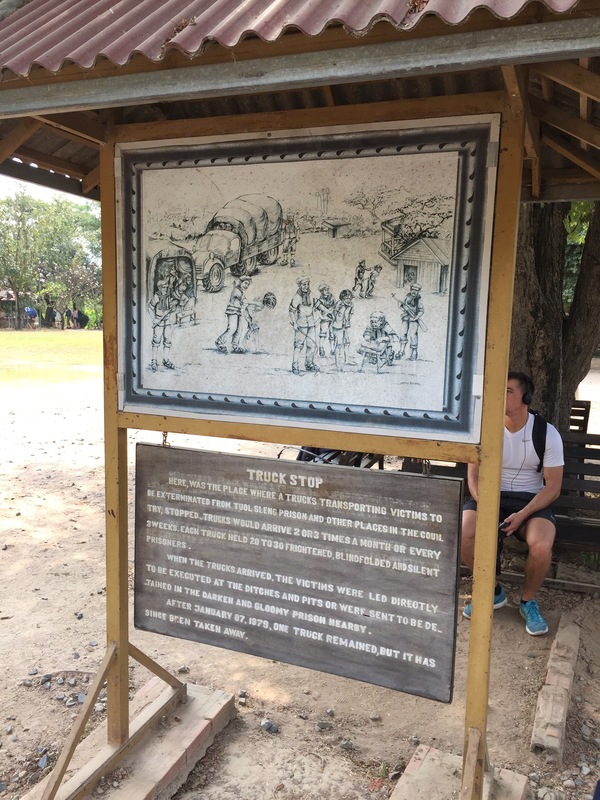 This is one of many sites around the country that were essentially used as slaughter houses and mass graves; eliminating anyone that the Khmer Rouge thought to be a threat. We then went to S-21, the former prison where individuals were kept before they were taken to be killed. The Khmer Rouge was headed by Pol Pots and was a communist dictatorship in Cambodia for just 4 years. You may not think that this is very long, however they did not mess around. On the first day that they took control the main cities were almost emptied. 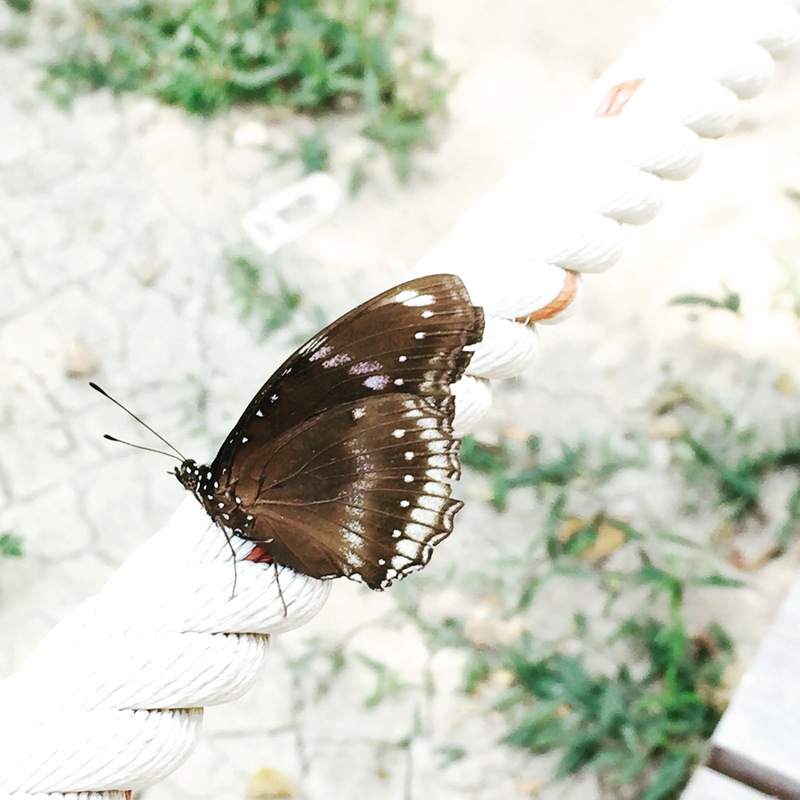 Families were split up and all citizens were dispersed to the countryside. Pol Pots wanted everyone to be ‘equal’ and Cambodia to become a self-sufficient country. Quickly all property and land was put into government ownership, money, education and religion were abolished and the new rural communities were forced into slave labour. Rice production was tripled, food was rationed and anyone who stepped a toe out of line was punished. Next people were recruited to the Khmer Rouge. These were mostly young, male farm hands with little education; as these were seen to be the easiest people to manipulate. They helped the Khmer Rouge in their quest for communist power and took part in the killing and torture of so called ‘criminals’. These ‘criminals’ were not criminals at all. As previously mentioned Pol Pots wanted anyone who was a potential threat to his new regime eliminated; indeed one of his favourite sayings was ‘better to kill an innocent person than let a guilty one run free’ – real charming guy. Anyone who was deemed to be educated, including those who had soft hands and wore glasses (because that makes sense) were seen as a threat and people were arrested and rounded up in their hundreds. One of the prisons they were sent to was S-21, which was formerly a high school before the regime. Ventilation was boarded up and the classrooms turned into tiny cells where prisoners were chained. Torture rooms stood in one block and served as ways to force false confessions out of people; if you were being beaten, waterboarded, starved and hung up by rope I’m sure you would also find yourself admitting to crimes that you did not commit. Sometimes incarceration lasted for months. Sometimes the torture was so brutal that prisoners died there and then. Once a prisoner had confessed to these so called crimes, they were put into a lorry in the dead of night and told that they were being moved to new premises. 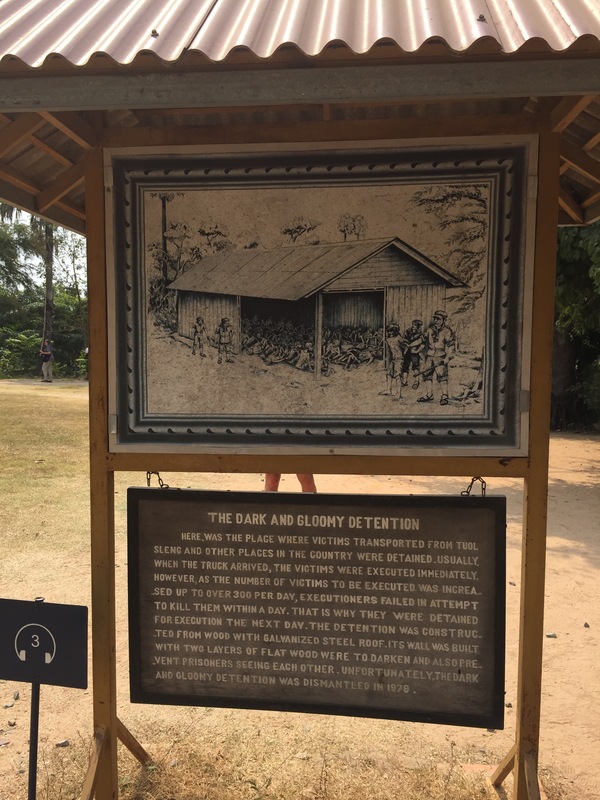 They were actually being taking to the killing fields, where on arrival they would be beaten to death and thrown in pits where they were buried. Babies heads were smashed against trees while their mothers watched in horror, women were raped and stripped of their clothes and men beheaded. All the while communist music was blasted eerily through speakers to drown out the screams. 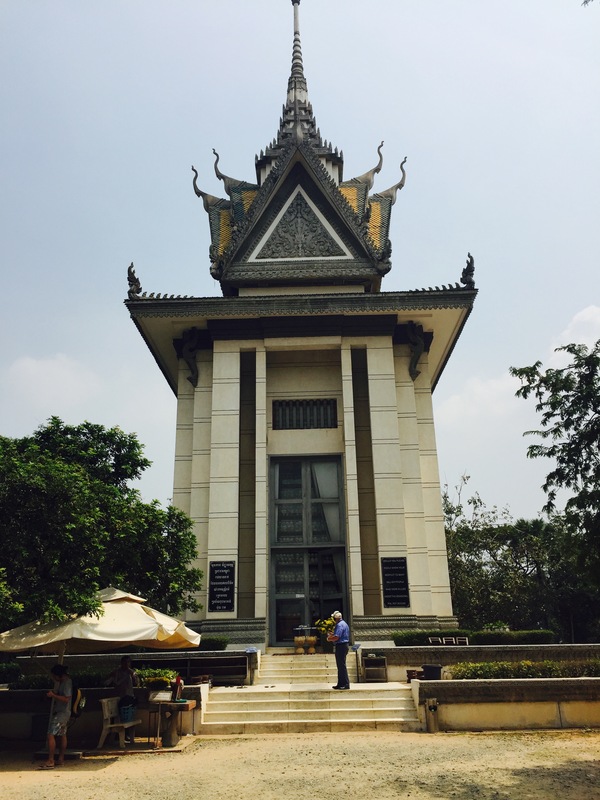 Overall, around 40% of Cambodia’s population were murdered. That’s one in 4 people and all the while the rest of the world was oblivious. It was only in the 1980s, after the Khmer Rouge had fled Cambodia into neighbouring Thailand that people came across the killing fields and realised what atrocities had taken place. Maybe worst is that Pol Pots lived his life in hiding in Thailand quite happily until his death in the late 90s, and was never punished for his heinous crimes. 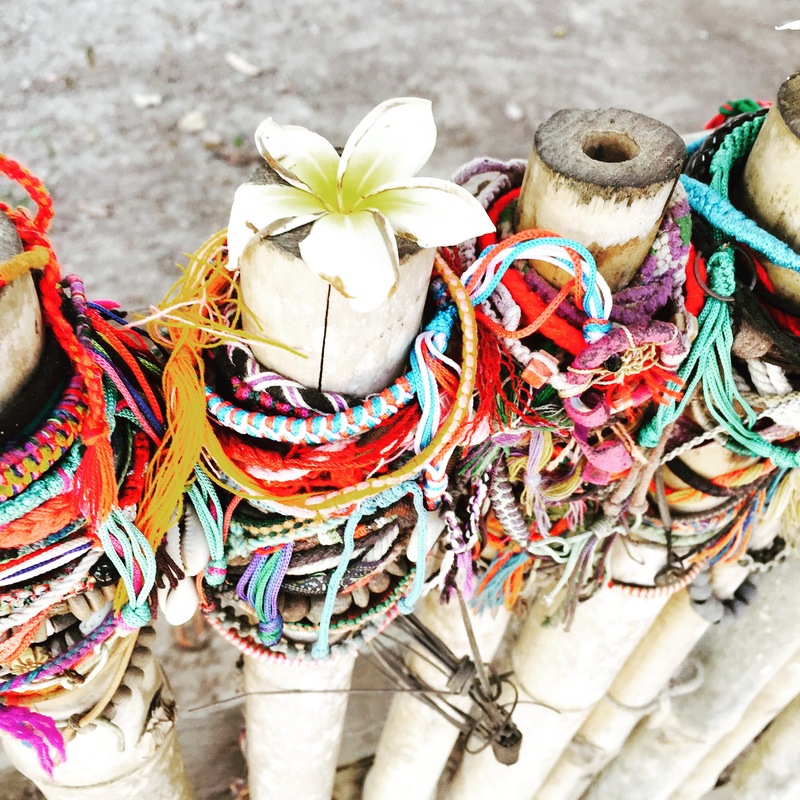 Bracelets and flowers left by mass graves in rememberance. 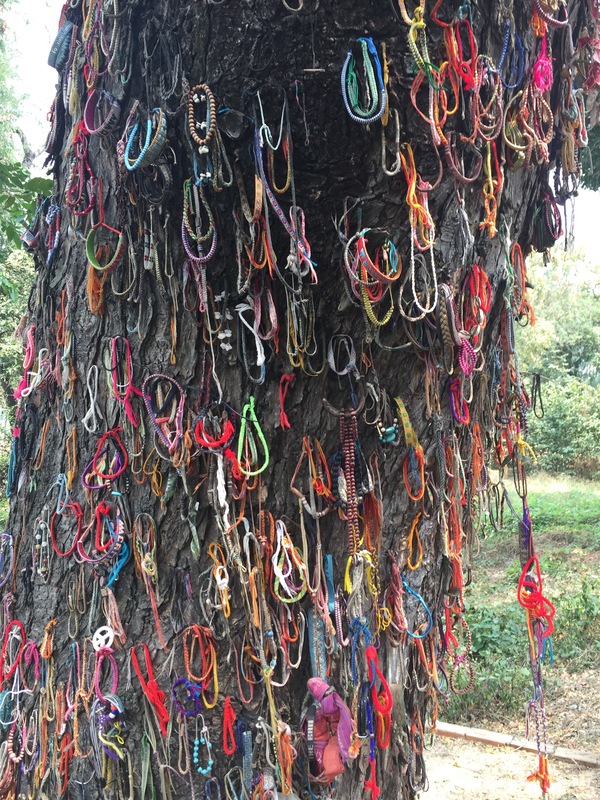 The ‘Killing Tree’, where babies heads were smashed. 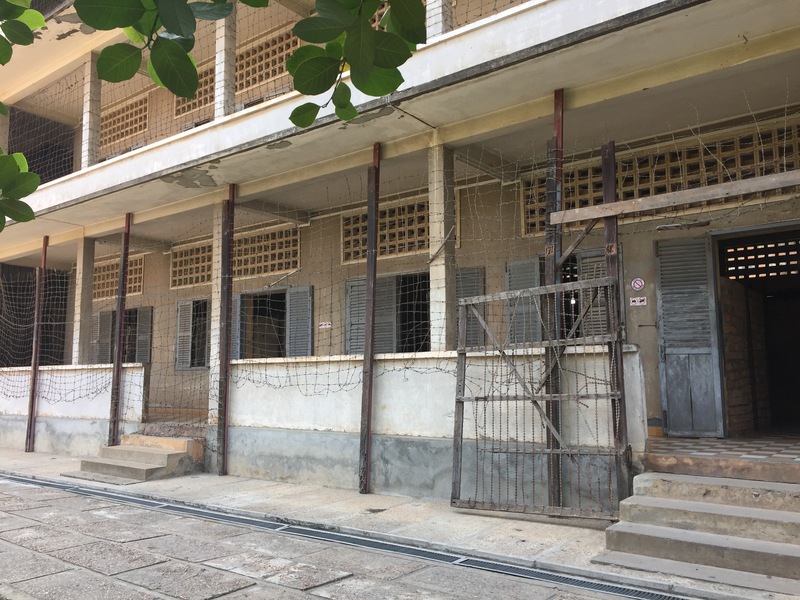 It is only in the last ten years or so, that Cambodia has managed to seek justice for what happened, with many of the main Khmer Rouge members being either on trial or in jail. It is little comfort though to the survivors who lost family members, friends and experienced the regime first hand. The country has courageously continued to try and mend their country and with it their physical and psychological pain. This was an extremely sobering day for us, but I am so glad that I now know about the events. Both museums are hugely informative, with audio tours that I advise you listen to. 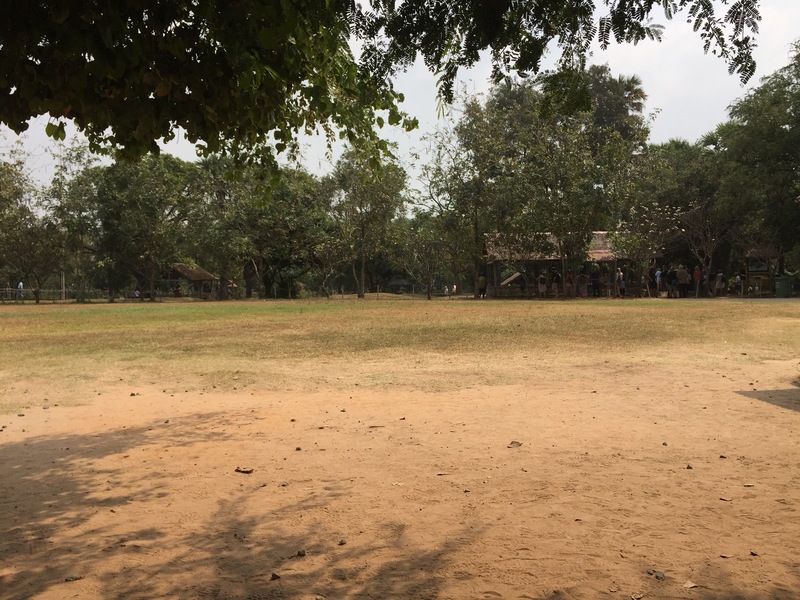 While the buildings of the Killing Fields were destroyed many years ago in anger, S-21 remains almost exactly how it was left. There are photos of prisoners, stories of victims and survivors, and memorial monuments at both sites for people to pay their respects. Memorial at the Killing Fields, which houses 8000 skulls found. The Khmer Rouge’s regime echoed Nazi Germany in so many ways, yet once again it is not a slice of history that UK schools bother to teach. I only hope that in time Cambodia manages to find peace and is truly able to recover from this genocide. Very moving – such an horrific part of history and as you said amazing strength of character the country has. And very sobering thought ,we take freedom of speech for granted ,very lucky to live where we are.